Offering Stick, TIG, MIG, FCAW and CAC-A processes, the Big Blue Eco Pro reduces fuel use up to 25 percent and is 44-percent smaller/41-percent lighter than other models with similar output, according to the manufacturer. Miller Electric Mfg. 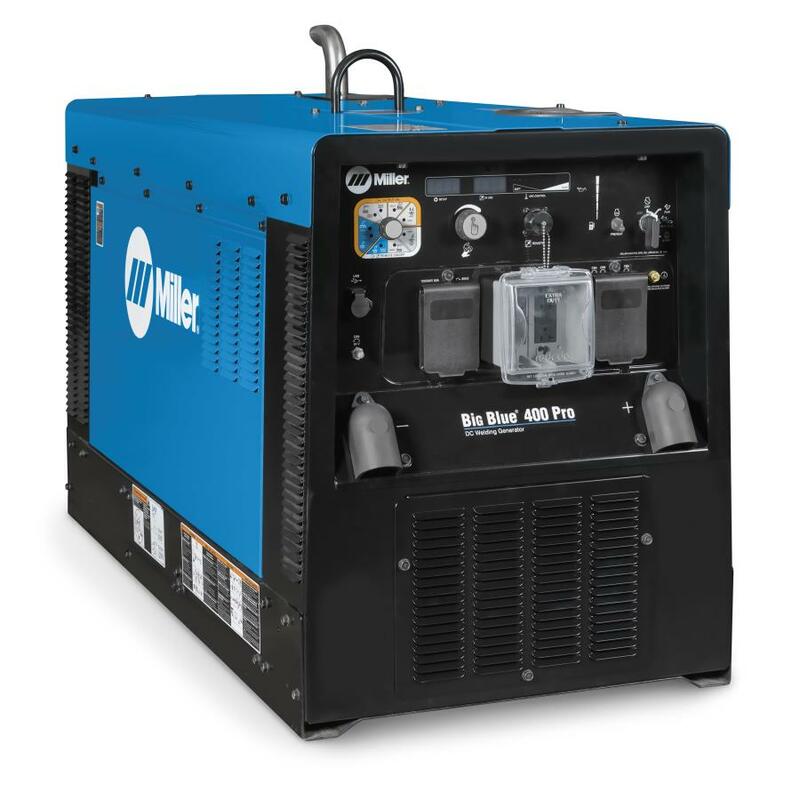 Co.’s Big Blue 400 Eco Pro welder generator is practical for work in pipe welding, structural steel, fabrication, field maintenance and repair applications. Offering Stick, TIG, MIG, FCAW and CAC-A processes, the Big Blue Eco Pro reduces fuel use up to 25 percent and is 44-percent smaller/41-percent lighter than other models with similar output, according to the manufacturer. Its 5,500 watts of peak power will run lights, grinders and many electrical tools, while its Mitsubishi S4L2 Tier IVi compliant diesel engine is designed to run 10,000 hours before a major overhaul and produces 50-percent less noise than previous models. Taking into account average diesel costs of $4.00/gallon and the habits of a typical user — 50 percent idle time, 40 percent at 150 amps, and 10 percent at 400 amps — a welder can save up to $1,990/year per machine in fuel costs without sacrificing performance, according to the manufacturer. 300 amps/100 percent duty cycle for Stick, TIG and Flux Cored welding in economy mode (1,800 rpm). 400 amps/100 percent duty cycle for welding and 500 amps/40 percent duty cycle for carbon arc gouging (up to 5/16-in. carbons) in power mode. All rated outputs are rated at 104 F (40 C) and tested to 122 F (50 C) for optimal performance and integrity. Circuit boards are protected by Miller’s sealed aluminum vault that protects the machine’s electronics and performance from heat, moisture, dust and other atmospheric contaminants. The operator interface is simplified with color-coded output terminals, a weld process select switch and newly designed fuel gauge/monitor. The fuel gauge includes an hour meter, oil change interval monitor, high coolant temperature/low oil pressure and low fuel shutdown that shuts down the engine before it runs out of fuel, making restarts easy. The machine also features thermal overload protection to prevent machine damage if the duty cycle is exceeded or airflow is blocked. Up to 44 percent smaller and 41 percent lighter than other models, the Big Blue 400 Eco Pro takes up less room and reduces transportation costs while cutting operating costs by reduced fuel consumption, according to the manufacturer. For more information, call 800/426-4553 or visit www.MillerWelds.com.